​Nothing warms my heart more than seeing a family welcome a new dog into their home. Growing up with a dog is one of the great joys of childhood — the bonding, the long walks after school, the shared distaste for green vegetables. In so many ways, animal care professionals do a great job of teaching new pet parents the ins and outs of dog ownership, from the vaccine regimen to choosing the right time to spay or neuter. But in other ways — particularly when it comes to safe pet-handling skills — many would argue that we’re still playing catch-up. Safe dog handling is vital to the safety of both the pet and the person. Fortunately, good handling is a teachable skill. Here are five things your dog wishes you knew about picking him up. Dog limbs are a wonder of form and function, meant to propel pups forward with speed and agility. They aren’t designed to support the entire weight of the dog when he's suspended in the air, however. The most common form of dangerous pet handling I see, particularly with young children, is when they lift a pet by the front limbs as if it were a doll. 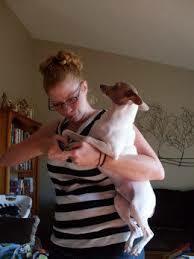 Adults tend to put their hands under the armpits of the dog and lift, as one would a human child. Both techniques are incorrect. When a dog is lifted by his front limbs, instead of properly supported by the chest and pelvis, it puts unnatural force on the elbows, shoulders, front toes and even spine as the pet dangles in the air. This can strain the muscles that support the front limbs and spine, tear ligaments, and potentially even dislocate a shoulder or elbow. In the worst-case scenarios, it can damage the bones and cartilage, particularly if the pet struggles and is dropped. The pain and risk of injury is compounded in older dogs who may already experience degenerative changes in these joints, such as arthritis. One of the greatest myths I hear dog owners repeating is, “If he isn’t yelping, he isn’t hurting.” Like people, some dogs are more dramatic than others and will waste no time letting you know if something bothers them. But other dogs are quite stoic and will tolerate discomfort to a much higher degree before protesting — assuming they protest at all. Clearly, yelping or growling are obvious signs of discomfort in a pet. But there are plenty more. All dog owners should know the basic signs of anxiety in a dog: avoidance, struggling, averting his gaze, licking his lips, "half-moon eye" or showing the whites of his eyes, and yawning are just a few. These signs are indicative of a dog who is uncomfortable, and that means you need to stop what you are doing and reassess the situation. Incorrect, and a variation of this is that the dog (normally pup or small breed) is picked up just on the scruff of it's neck. Another common misconception I hear is that scruffing, or lifting a dog by the nape of his neck, is a normal way to pick him up. After all, that's how his mother carried him when he was a puppy. While this is true, it was only in the brief, early weeks of life, and this behavior doesn't continue when the pups are grown. Just as our mothers stop carrying us on their hips after a certain point, scruffing is not comfortable or natural for grown dogs. According to the CDC, about 4.5 million dog bites occur each year in the U.S., and half of those take place at home, with a familiar dog. Children from 5 to 9 years of age are at highest risk. While there are many causes, understanding humane handling and the signs of stress are key ways dog owners can help prevent family members from becoming another statistic. If the dog is small (under 25 pounds), place your dominant arm under his chest, between the front limbs, while tucking his back end between that same arm and your torso (what some of us might refer to as the football hold). For medium-size dogs (between 25 and 40 pounds), place your dominant arm behind the dog’s back legs, and your non-dominant arm around his chest, in front of the limbs and stabilize the dog against your chest as you lift. This helps ensure the pet is properly supported and comfortable. Ideally, larger dogs really require two people to be picked up properly: one lifting from beneath the chest and the other lifting from the abdomen and rear. If your dog is scared or in pain, care should be taken to avoid getting your face or hands near his mouth, in case he might bite. If he is injured and you need to lift him to safety, consider using a muzzle (only if he is not having difficulty breathing) and sliding him onto a board for support. Always, always ask permission before picking up a dog. 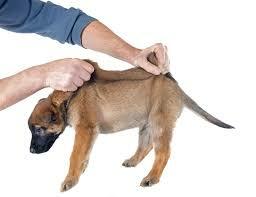 If a pet shows signs of discomfort or tries to get away, you must let him go. If a pet appears injured, don’t pick him up — get an adult to help. Interacting with dogs in a safe and humane manner helps increase safety, reduce injuries and build trust. With a little training and encouragement, all kids can be taught the correct way to pick up a dog. As an added bonus, your kids can then teach their friends and other adults how to do it right! You may be excited and cant wait for the new arrival - however do consider how it will affect your dog and set yourself up for a successful relationship between dog and baby. Our dogs may not 'speak' to us in English or any other language, however if you can learn what their basic body language is saying, you will be able to help your dog when stressed or not coping. ​Does your puppy need prozac? While the majority of dogs do not need Prozac for behavior problems, this option is now available for dogs.